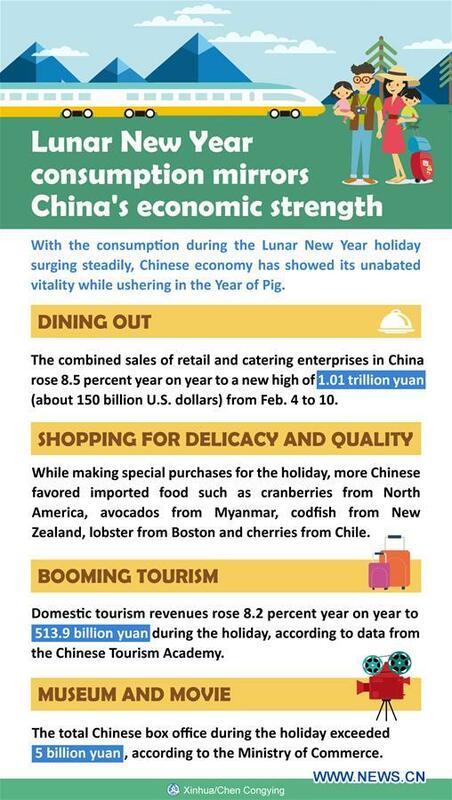 BEIJING, Feb. 11 (Xinhua) -- With the consumption during the Chinese Lunar New Year holiday surging steadily, the Chinese economy has shown its unabated vitality while ushering in the Year of the Pig. Better known as "the Spring Festival golden week" during which businesses vie to lure customers and expand their market shares, the holiday has always been an important barometer for the whole-year consumption power. The combined sales of retail and catering enterprises in China rose 8.5 percent year on year to a new high of 1.01 trillion yuan (about 150 billion U.S. dollars) from Feb. 4 to 10, according to the latest statistics from the Ministry of Commerce. Lunar New Year's Eve dinners, family reunion feasts and party dinners with relatives and friends dominated the festival dining consumption, but a lot more Chinese chose not to cook this year, resulting in an increase in Lunar New Year's Eve take-out orders by various degrees in different cities. In north China's Tianjin Municipality for instance, 36 major restaurants received 12,000 orders for Lunar New Year's Eve dinners, up 5.3 percent year on year. Beijing's major restaurants saw their revenue up by more than 10 percent during the holiday compared with the same period last year. The number of orders for fully- or half-cooked dinners sold online rose noticeably as more Chinese ordered ready to eat meals through e-commerce platforms or hired a chef to cook meals at home. On one online ordering platform, the number of orders for Lunar New Year's Eve dinners increased 107 percent, said the ministry. A customer surnamed Zhang in Qingdao of east China's Shandong Province said half of the food stored in her freezer for the Spring Festival were imported products. "There is a wide range of foreign food to choose from, and the prices are affordable," she said, which allows her family to slow down and relax during the holiday and enjoy delicacies. Chinese e-commerce giant JD.com said its sales from Feb. 3 to Feb. 8 rose by 42.7 percent year on year, with smartphones, computers and home appliances being the top three items in terms of sales value. Online shopping in lower-tier cities is booming thanks to an expanding e-commerce network. Sales growth in fourth-tier and sixth-tier cities exceeded 60 percent. The Spring Festival once again unleashed China's annual travel rush, with an increasing number of people opting to celebrate the holiday by traveling to tourist attractions. There was a 19-percent year-on-year growth in the number of Chinese tourists during the Spring Festival holiday, according to data from Fliggy, an online tourism service provider. The number of overseas trips taken by Chinese jumped by 28 percent year on year. Resort islands were highly popular, as the number of Chinese traveling to the destinations almost doubled. Many domestic popular tourist spots are favored by Chinese tourists. Sanya, Xiamen and Harbin were the top three places for Chinese tourists making longer domestic journeys, while Chimelong Tourist Resort, Shanghai Disneyland Resort, and Mount Huangshan were the hottest destinations. Ctrip, a Shanghai-based online travel agency predicted that nearly 7 million outbound trips would be made by Chinese tourists during the holiday. Countries along the Belt and Road, such as Thailand, Indonesia, Singapore, Vietnam, Malaysia, the United Arab Emirates and Cambodia are among the most popular outbound destinations. Meanwhile, the number of visitors to East European countries increased by nearly 40 percent year on year. Xiao Yinyuan, head of Ctrip's outbound travel business, predicted that there would be 30 million Chinese traveling to countries and regions along the Belt and Road in 2019. Going to museums has become a trendy thing to do during the holidays in China. A popular getaway this year was the Palace Museum where a special exhibition was staged to provide an immersive royal experience for visitors, with the entire Forbidden City adorned with newly-restored ancient royal lanterns and spring couplets, including a rare collection of the Chinese character "Fu," meaning happiness and good luck, written by five Qing Dynasty emperors. The former imperial palace was so popular that all tickets during the Spring Festival holiday had been booked in advance. Statistics from the Ministry of Commerce showed the museum hosted nearly half a million visitors during the holiday. Shan Jixiang, curator of the Palace Museum, said he hopes more Chinese will put museum tours on their must-do Spring Festival list alongside the Lunar New Year's Eve family reunion dinner, annual TV gala and watching films. Elsewhere in China, public enthusiasm for museums ran equally high. In central China, the Henan Museum received about 8,000 visits on Feb. 6, the second day of the Chinese Lunar New Year, twice the figure of a regular weekend day. Many museums staged exhibitions featuring pigs, the Chinese Zodiac animal of the new year. A pig-shaped bronze vessel, which dates back more than 3,000 years, is on display for the first time in the Shanghai Museum. Although watching Lunar New Year blockbusters has long been a tradition, Chinese audiences were particularly excited this year because of the debut of a domestic sci-fi blockbuster titled "The Wandering Earth" on Feb. 5. As of 7:00 p.m. Sunday, the film had earned over 1.94 billion yuan, becoming the winner of the Chinese box office during the holiday, according to Maoyan, a professional box office tracker. The total Chinese box office during the holiday exceeded 5 billion yuan, according to the Ministry of Commerce. Chen Han, a data analyst with China UnionPay, said that dining, shopping, traveling and entertainment had led this year's festival consumption and that their contribution had grown by 4.4 percentage points. Compared with previous Spring Festival holidays, Chinese people were more willing to spend more for either the elderly, children or themselves. Another spotlight was the growing cultural entertainment and tourism consumption, Chen said.